Telecoms deal currently with a new road map, as a result of the evolution of the technology. In the 80’s and 90’s the companies changed from old state monopolies to listed private groups. This step let them jump into technologies with fresh cash obtained to invest: internet, broad band, fibre and mobile services were developed in a rush (just 25 years) to the majority of the citizens. After this quick evolution, the branch lives now a new wave of consolidation. Companies try to organise their main services and markets, buying and selling in different movements: Spain, for instance, lives a reorganisation as Vodafone has recently bought a cable operator and other changes are expected from its competitors. However, by now, this is not the year of the telecom sector, if we take a look at four of the main world groups in T-Advisor. The Japanese NTT will obtain in its fiscal year (till march 2014) around $107,5 bn revenues (+2.8%), with a net income of $5.7 bn ($5 per share). American AT&T sales increased 1%, till $128,8 bn, with a net income of $18.25 bn ($3.39 per share). Spanish Telefónica obtained $78,74 bn revenues (-8.5%), with a net income of $6.33 bn ($1.39 per share). German Deutsche Telekom revenues in 2013 were $82.9 bn (+3,4%) and the net income amounted $1.28 bn after the losses in 2012 ($0.69 per share). Investors perceive that these big companies are not so promising as before. Revenues increased slowly, what reduce future chances of technology investments, purchases and profits. 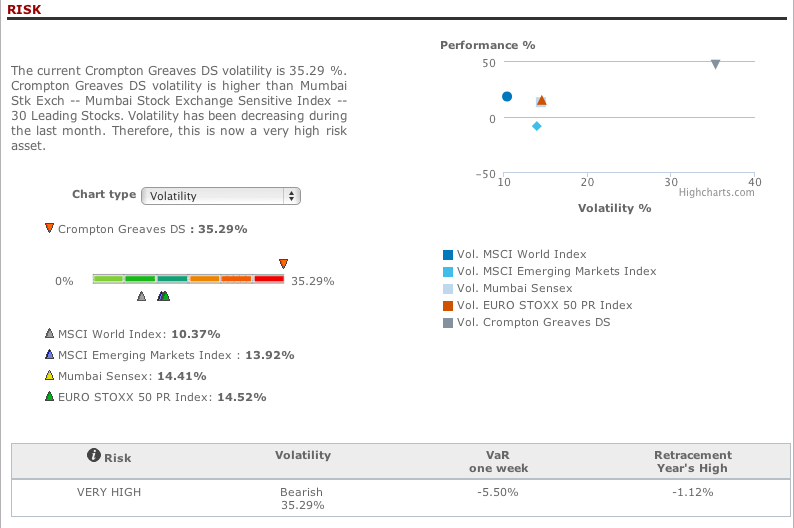 None has a positive performance since January 1st and the volatility is quite high to be a typical blue-chip. The score registers also the weakness of their magnitudes. It is possible that we have to include some new players (and exclude some of the currents) in a pair of years for a similar analysis. The ability to join new technological developments will be vital for it. This entry was posted in News and tagged AT&T, Deutsche Telekom, NTT, Telecoms, Telefonica on March 25, 2014 by Oscar Garcia. 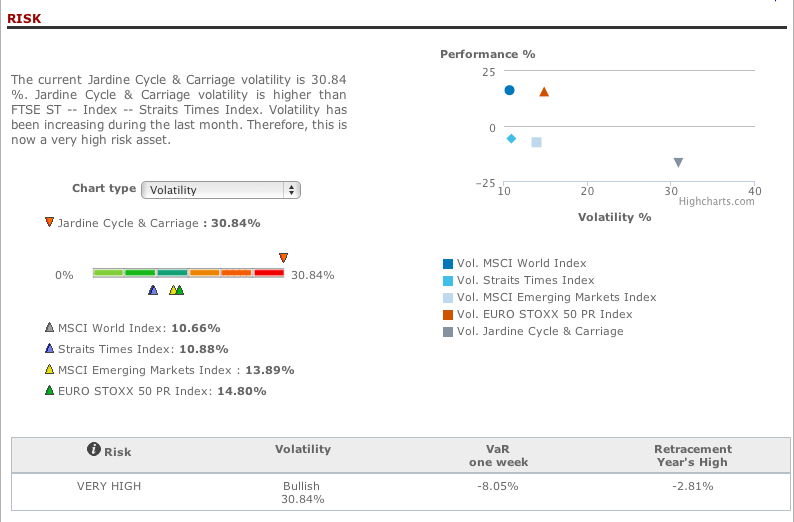 T-Advisor, through its tool Market Opportunities, has detected the company Jardine Cycle & Carriage, listed in Singapore Exchange, as an opportunity for investment. Jardine Cycle & Carriage is a diversified group focused on the Southeast Asian market. The company is member of the Jardine Matheson Group. Core business is auto distribution and retail in Singapore. It also has the majority of Astra, a leading conglomerate in Indonesia with business interests in automotive, financial services, heavy equipment and mining, agribusiness, infrastructure and logistics, and information technology. In addition, has directly-held motor subsidiaries operating in Singapore and Malaysia under the Cycle & Carriage banner and other motor interests in Indonesia, Vietnam and Myanmar. This entry was posted in Market Opportunities and tagged Investment, Jardine Cycle & Carriage, Opportunity on March 24, 2014 by Oscar Garcia. An investor has always an active attitude, because he or she is always taking care of the invested money. Sometimes it is necessary to change some assets from the portfolio: they are not performing as expected or they are losing compared with the initial position. Looking for investment alternatives is hard to do, as investors need a reliable source with many figures and analytics to take the best decisions. 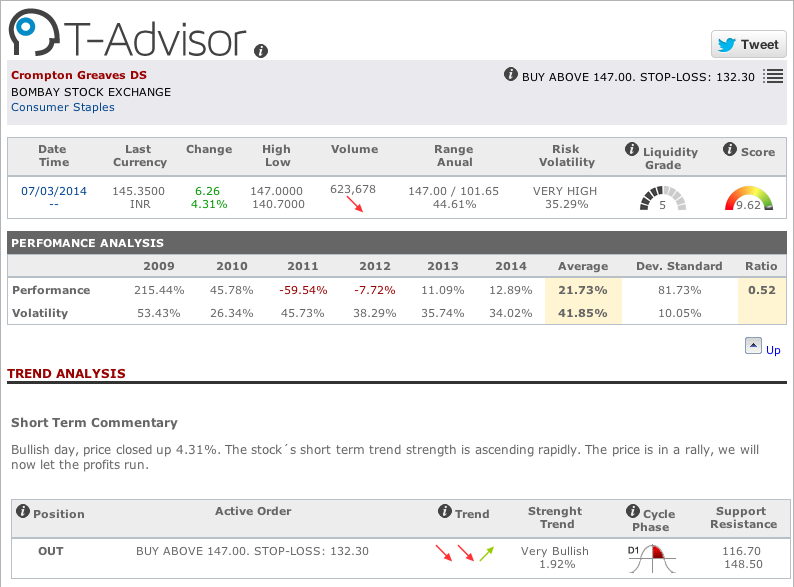 T-Advisor offers some different ways to find the best alternatives for your portfolio. The first one is available in every report for every asset. You can download for every position a “T-Report” with the whole data… and some investment alternatives at the end, if you are not really convinced of it. The software chooses for every asset a range of alternatives depending the market and the sector and organises them ranked by the strength trend, from the more bullish to the bearish ones. The second way is the tool “Investment ideas”, which is updated every week and selects under quantitative criteria the best options of a list of 30 developed and emerging markets around the world. In this case, you obtain an alert for an entry price and a stop loss for every asset in the list. You can also download the report with the whole figures. The third way is the tool “My T-Advisor”, from which we have already written in this blog. 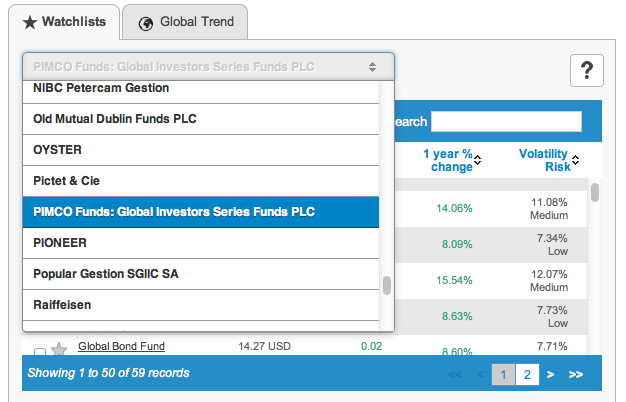 This tool provides some alerts with investment alternatives to the assets of you portfolio. The selection is made automatically by the software from quantitative criteria applied to your portfolio. Taking right investment decisions is hard, but it is harder if you do not have available tools that provide you the best reports and information of several alternatives. Our developers were aware of this point and that is why the software was conceived to provide many ways so that an individual can find the best asset that fits his or her goals. This entry was posted in Discover and tagged alternatives, Assets, quantitative criteria, report on March 20, 2014 by Oscar Garcia. 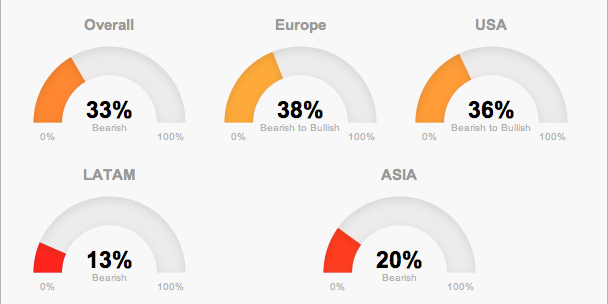 The current world situation has some points of instability for the markets. Last year, the earnings were quite high after the financial crisis years, but 2014 began with a more complex landscape, mainly in the emerging markets, as we have written before in this blog. As we see in the chart above, the main trend is still bearish for all the markets. What is happening? The first problem has to do with central banks. Janet Yellen, new chairwoman in the US Federal Reserve, seems to be “dovish” as she prefers to delay somehow the taper of the quantitative easing or, at least, wait more for an increase of the interest rates (announced for 2015), not linked to a concrete unemployment rate. Is it good? Not necessary, if the Fed mentions in today’s and tomorrow’s meeting that the US economic recovery is slower than expected. On the other side of the Atlantic, ECB chairman Mario Draghi announced surprisingly in last press conference that the institution will not take any decision in the monetary policy although the credit flows are still low, there are downside risks for inflation and the exchange rate euro-dollar is touching the psychological 1.40 $ border. This exchange rate is risky for European exports and has influence in the decrease of the inflation, as import prices pressure to lower prices. An outlook of lower prices is critical, because it delays consumers and investors decisions to buy. In the Asian front, China worries the markets, as there are some dangerous signs related to the financial and the export sector, amongst others. But the markets follow carefully the developments in Ukraine. Recent political events in Crimea increased concerns for the effects of the economic sanctions imposed to Russia by the EU and US, apart from the risk of a conflict on the land. Next weeks will be decisive to watch the evolution of the markets: will instability be part of 2014? Or are all of these risks just an exception in a possible upward trend? This entry was posted in News and tagged China, ECB, Federal Reserve, risks, Ukraine on March 18, 2014 by Oscar Garcia. T-Advisor, through its tool Market Opportunities, has detected the company Ameris Bancorp, listed in Nasdaq as an opportunity for investment. Ameris Bankcorp is a financial institution that provides a whole range of banking services for business and personal customers. Founded in 1971, its current assets are around US$ 3bn. It is listed in Nasdaq since 1987. This entry was posted in Market Opportunities and tagged Ameris Bancorp, Investment, Opportunity on March 17, 2014 by Oscar Garcia. Investors organise efficiently their portfolios to obtain the highest returns, but a portfolio has to be followed up, because some adjustments are sometimes necessary. The problem is how to detect the best changes to get the profit goals. 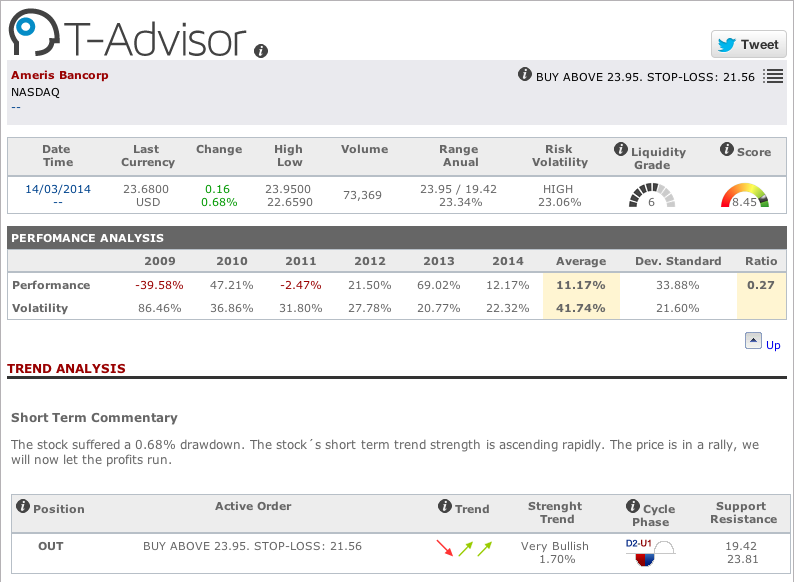 That is why T-Advisor developed the tool “Optimizer” for this target. 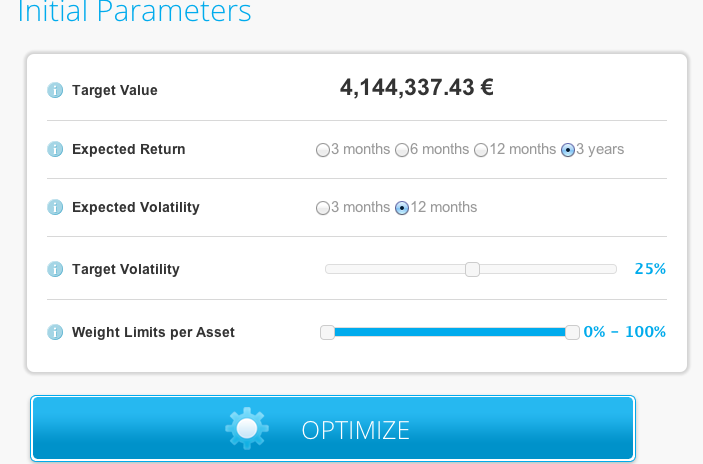 In the Optimizer, the investor can choose the expected return and volatility depending the term (shorter or longer), as the percentage of acceptable volatility and the weight limits per assets. Clicking on the “optimize” button brings the results. From the beginning point and the chosen settings, the tool calculates different parameters. The efficient frontier is a visual comparison between the current position and the optimal one, linking volatility and performance. The investor can also learn which assets should be changed in their weight to optimize the returns. At the end, investors have a helpful tool to adjust their portfolio and adapt their assets to the changing market. What are the main advantages of this tool? 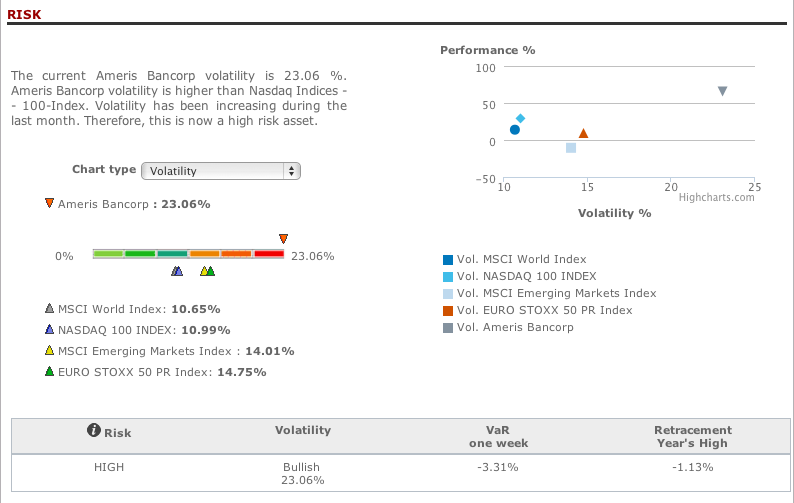 Well, first of all, it lets combine different risk limits (volatilities) with different terms of expected returns. The result is that the investor can choose amongst different possibilities depending his or her interests or circumstances. Secondly, it is helpful to discover correlated and non-correlated assets. With this information, the investor can reduce the risks and maximize the returns. Moreover, the tool lets the investor decide about which positions should be enlarged and which should be reduced to obtain the targeted performance. 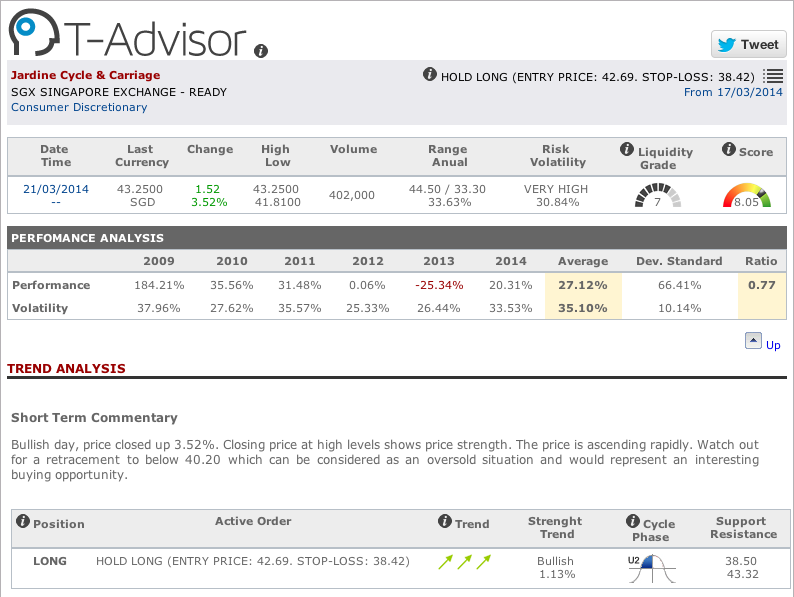 To sum up, T-Advisor Optimizer is an easy visual tool that reports the investor about the changes to be done in the portfolio to get the best results. The main advantage is that the tool has different settings available so that the investor can choose which one fix to their particular requirements: the freedom in one click. 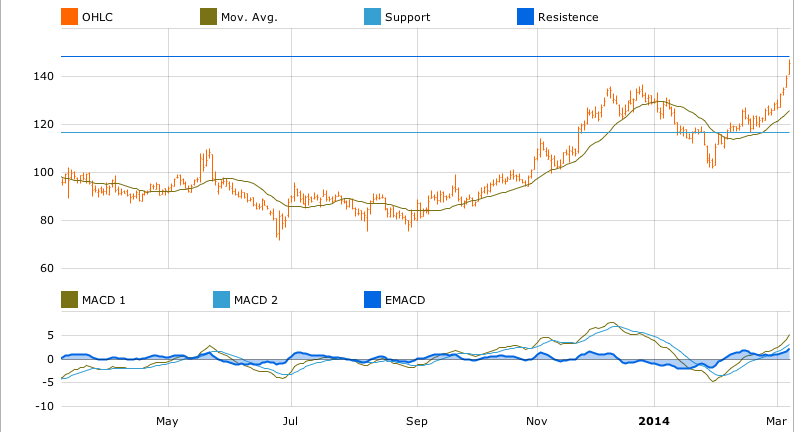 This entry was posted in Discover and tagged asset, correlation, Performance, Portfolio, risk on March 13, 2014 by Oscar Garcia. Think about you are a trader and you want to profit from the price movements in the short term in the stock markets. Think about you have identified a bullish trend, but you know that stocks go up and down in a long-term direction. What are you looking for? Short-term trends (or cycle phases). We have already written about trends and the strength of them. Now the point is how to earn money with trading if you are a very active investor. The four charts above point the four main cycle phases. In T-Advisor we identify them with a U (from UP) and with a D (from DOWN). They are signalling different movements into a general trend: for instance, there is a D2 although the general trend is bullish. Shortly, a U1 is the beginning of a short-term upward trend. The trader should take into account the entry price. A U2 points a brake in this trend. Be careful, because you have already some earnings. You have to take into account a sell price. 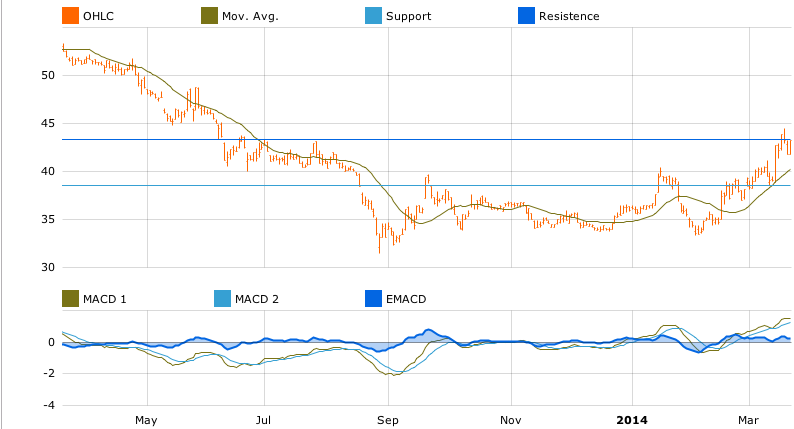 A D1 announces the beginning of a short-term downward trend: it is time to sell and enjoy the earnings. A D2 shows the end of this movement. If you have not sold before, just wait till the short-term direction changes. If you have any stock, maybe it is time to follow the prices to buy in the right moment. There are also some other charts, as the one above, that combine two cycles in the same pictures. These are quite important, as they are pointing the exact moment of the changing trend. For instance, the chart above is the change from down to up: then it is time to buy. Learn about these short trends let the investor foresee the market movements and how to react. For a trader, this information is vital. That is why we always insist that figures, charts and data are the main strength in T-Advisor for their users. This entry was posted in T-Advisorpedia and tagged Bullish, cycle phases, Trends on March 11, 2014 by Oscar Garcia. February is usually an unstable month for the markets. In this case, emerging markets have suffered more from this instability. We have already spoken about it before. The current quantitative easing cut made by the Federal Reserve affects negatively the capital flows to these countries. Even more, the worst markets in our list (from the last) are Peru, Brazil, Japan, Chile, South Africa, Mexico and Turkey. With the exception of Japan as developed country that is living some different conditions, the others are emerging markets mainly in Latin America. In this case, the drop begun last year in June. Although the line was stable in the autumn and the beginning of the year, it registered a new hard decline in February. Just to compare: Latin American countries quoted before have less than 20% of their listed companies with a bullish trend (in Peru and Chile, less than 9%), while Asian countries as China, Singapore, India and Hong Kong have between 20-25%. The only exception in this trend in emerging markets is Argentina, with some different components in its economy. At the top of this list, the leaders were continuously in February the denominated PIIGS (Portugal, Italy, Ireland, Greece and Spain). Their markets, as we published before, were cheap for investors and attracted capital flows in their exchanges. In these cases, they had always bullish more than 40% of their companies (in Portugal, up to 60% or a bit more). This kind of charts helps investors to detect risk and investment chances in the current pricing of the markets. 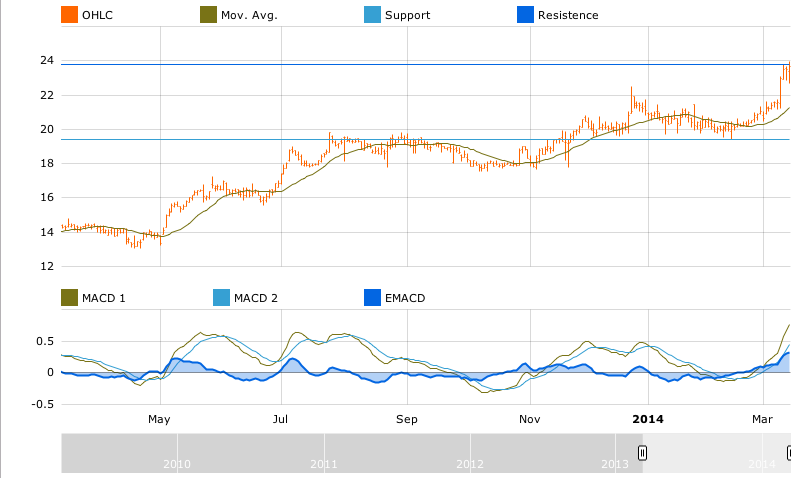 This entry was posted in Our Charts and tagged Asia, global trends, Latam, PIIGS on March 6, 2014 by Oscar Garcia.